It’s in the 50’s again in southern Michigan. I stopped into one of our local MickyD’s and tried out a new specialty coffee. Not bad. Not sure it’s as good as a Starbucks, but then I haven’t had one of those for some time. Guess I’m not the right person to be doing critiques of the gourmet coffee world. 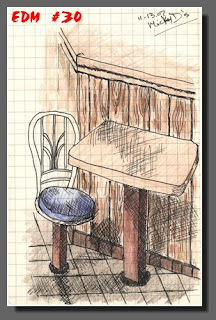 So, while sipping my high calorie cup of coffee, I did a sketch of the table and chair across the way. This is in my note-keeping moleskin with a micro pen and colored pencils. They have such strange little chairs in these places. They really don’t turn very far. I’m not a fan. Nice little sketch break though. Thank you! So nice to have you stop by my blog!! What a charming little sketch and very nicely done, too!